What’s Next in the War Over Obamacare? The GOP hasn’t given up yet, and activists aren’t ready to celebrate. You may have heard that Obamacare is “failing,” but really, it’s proved remarkably durable. The law has survived a flubbed rollout, uncooperative conservative state lawmakers, two legal challenges brought to the Supreme Court, more than 50 repeal votes in the House, and, at least for now, a rushed and secretive legislative onslaught from the Republican-controlled House, Senate, and White House. 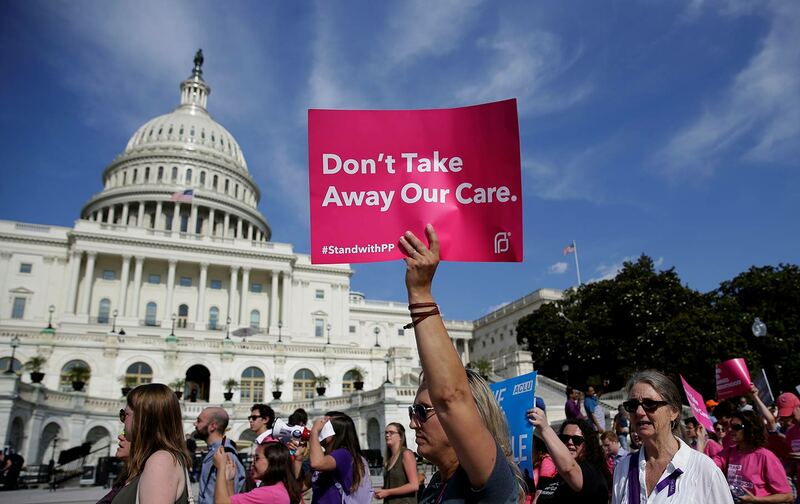 Even after the collapse of Senate Republican’s most recent attempt to gut the law, however, Obamacare’s future—and the well-being of the millions of people who depend on it for insurance coverage—is uncertain. Senate majority leader Mitch McConnell initially said he would hold a vote next week on a bill to fully repeal Obamacare with nothing to replace it. That plan was immediately doomed, as several Republicans vowed to vote against repeal-only legislation. On Wednesday night, a group of GOP senators huddled in search of a way to revive the stalled replacement bill. The plan, reportedly, is to buy off their reluctant colleagues. However the vote goes next week—if it goes at all—there’s plenty the Trump administration can do behind the scenes to cripple the health-care law. “We’ll let Obamacare fail and then the Democrats are going to come to us,” Trump told reporters on Tuesday. “Let Obamacare fail” really means make it fail—a strategy the Trump administration has been flirting with for months. In April, Trump threatened to cut off payments to insurers (known as cost-sharing reductions) that help to lower out-of-pocket costs for lower-income people. If he does so now, insurers would either raise premiums, or exit the market completely. Trump could also choose not to enforce the tax penalties for people who forgo insurance, or not to advertise enrollment periods, both of which would destabilize markets even further. Yes, Obamacare’s individual marketplaces are already unstable in some areas. There may be no insurers offering plans in more than three dozen counties in Indiana, Nevada, and Ohio next year, and only a single insurer in others. Premiums are expected to rise. But a more basic problem is that the people now overseeing Obamacare would like to see it fail—specifically Health and Human Services Secretary Tom Price and the administrator of the Centers for Medicare and Medicaid Services, Seema Verma. Both trumpet any bad news about the “collapsing” markets, while doing nothing to stabilize them. Insurers themselves have explained that the Trump administration’s actions (or lack thereof) are one of the primary reasons for instability and premium hikes. For activists who’ve been working to preserve the ACA, the main priority now is making sure that the GOP’s repeal effort doesn’t reemerge from its shallow grave. “We don’t want to get ahead of ourselves…. As long as Mitch McConnell is the majority leader, we’re not going to take anything for granted,” said Angel Padilla, the policy director for Indivisible. Padilla said he won’t feel certain that repeal is off the table until Republicans start working in earnest to strengthen Obamacare via bipartisan legislation. Even then, he warned, advocates should be wary of harmful amendments—and for a continued assault on Medicaid, which predates Obamacare. “Republicans have been trying to restrict Medicaid for decades, and it’s not going to end through this repeal fight,” said Padilla. Also on the horizon, if the repeal effort does truly die: the ongoing struggle to expand Medicaid in the 19 states that have not done so. According to Families USA, more than 6 million people would gain coverage if those states decided to expand their programs. In April, Kansas’s Republican legislature approved the expansion, though it was vetoed by Governor Sam Brownback. Maine residents will vote on an expansion referendum in November. In North Carolina, the state’s Democratic governor and Republican legislature are locked in a fierce standoff over the issue. Then there’s the brewing push from the left for universal coverage through a single-payer or “Medicare for all” system. “Ultimately, the answer to a fairer, less complex, less stressful health care system is some form of [Medicare for all]” tweeted Oregon Senator Jeff Merkley in response to news of the demise of Trumpcare. Al Gore, who is hardly a fringe figure, also endorsed the idea on Tuesday. Senator Bernie Sanders is set to introduce legislation in the coming weeks; meanwhile, a new Pew survey finds growing public support for such a system. With groups like the National Nurses United and the Progressive Campaign Change Committee organizing grassroots support, momentum is growing—and McConnell’s debacle has only helped.